Cantilever A projecting beam supported only at one end, the deflection of which is directly proportional to the force applied normal (perpendicular) to the beam axis. 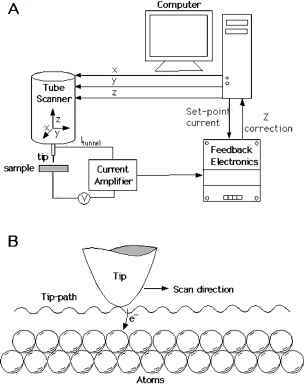 Constant-current feedback control Regulation of the piezoelectric scanner position based on the magnitude of the electron tunneling current in a scanning tunneling microscope. Constant-force feedback control Regulation of the piezoelectric scanner position based on the magnitude of the force between the cantilevered probe and sample in an atomic force microscope. Electron tunneling A quantum mechanical process in which electrons penetrate potential barriers such as a vacuum gap between two metals. Feedback control Self-corrective optimization of device performance by modification of input based on analysis of output. Piezoelectric scanner An electrical-to-mechanical transducer that allows precise (angstrom level) positioning and movement in all three dimensions. Raster scanning A scanning pattern in which a probe is swept side to side in lines over an area from top to bottom. SCANNING PROBE MICROSCOPY (SPM) refers to a general class of microscopy techniques that produce high-resolution, high-magnification images by scanning a sharp probe back and forth over a specimen. Scanning tunneling microscopy (STM), the first SPM method to be developed, uses a current-sensing probe to record the topography of conducting samples. The spatial resolution of STM topographic images is extremely high, better than 1 A (0.1 nm or 10-10 m), enabling direct visualization of atoms and molecules. Another scanning probe technique, known as atomic force microscopy (AFM), uses a force-sensing probe to track sample topography. The topographic resolution of AFM ranges from 1 to 20 A depending on the operation mode and the specific sample characteristics; under favorable conditions true atomic resolution can be obtained. A practical difference between the two techniques is that AFM does not require that the sample be electrically conducting. Since their invention in the 1980s, STM and AFM have provided scientists with exquisitely detailed snapshots of a wide variety of structural and chemical phenomena occurring on surfaces. The impact of STM on our understanding of surface chemistry and physics was apparent immediately. In 1986, Gerd Binnig and Heinrich Rohrer were awarded the Nobel Prize for their invention of the STM only 5 years earlier. The success of STM and AFM has led to the proliferation of scanning probe technology in all aspects of science and industry. New scanning probe microscopies have been developed that allow high-resolution imaging of a large spectrum of sample characteristics in addition to topography, including frictional properties, local electric and magnetic domains, thermal behavior, optical absorption, fluorescence, and birefringence. SPMs are now valued not just as imaging instruments, but as important analysis and metrology tools for examining a range of material properties on nanometer length scales. Scanning probe techniques continue to be developed and to have an impact on virtually every area of technology ranging from molecular biology to semiconductors, surface chemistry, catalysis, and nanofabrication. late the probe-sample distance. Different SPM methods are distinguished by the specific feedback mechanism employed and the type of data, in addition to topography, that are recorded. The different feedback mechanisms are best understood by considering specific SPM techniques. All scanning probe microscopes have (1) a mechanism for bringing a sharp probe into close proximity with the sample surface, (2) a mechanism for scanning the probe in a raster pattern, and (3) a feedback mechanism for regulating the distance between the sample and probe while scanning. These functions, as well as image acquisition and display, are controlled by a computer and associated electronics. 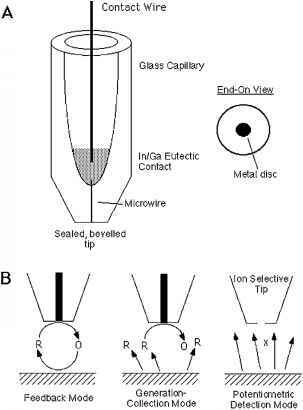 The initial approach of the probe to the sample is accomplished with a simple one-dimensional translator such as a finely threaded screw or piezoelectric element. This translator must be able to move the probe a distance on the order of millimeters toward the sample. Once the probe tip is in contact or near contact with the sample, the probe (or the sample) is scanned in a raster pattern, similar to the way an electron beam is swept back and forth across the screen in a television set. Scanning is accomplished with piezoelectric elements capable of moving the probe in the X and Y dimensions with angstrom-level precision. Tube-shaped piezoelectric scanners are often used in which the probe is attached to one end of the tube. Voltages applied to the tube cause it to bend back and forth, generating the scanning pattern. FIGURE 1 (A) Schematic illustration of a scanning tunneling microscope. (B) Tip trajectory as it tracks surface atomic structure in constant-current mode. measured current is higher than the setpoint current, the feedback electronics applies voltages to the Z axis of the tube scanner to make the tip retract until the current equals the setpoint. Conversely, if the measured current is too small, voltages are applied to the tube scanner to extend the tip closer to the substrate until the current increases to the setpoint value. Essentially, the goal of the feedback electronics is to zero out the "error" signal, or the difference between the measured current and the setpoint. This electronic feedback process is very quick, requiring only fractions of a second, so that the tip may track the surface topography while scanning at speeds from 100 to several thousand nanometers per second. The tube scanner is calibrated and therefore it is known how many angstroms the tip moves in the X, Y, and Z directions for given applied voltages. Topographic height images are produced by recording the Z-axis position of the tip as a function of its X and Y coordinates (pixel position). It is a remarkable fact that the constant-tunneling-current methodology allows the tip to track the topographic contours of individual atoms, as shown schematically in Fig. 1B. The resolution of STM height images is typically better than 1 A in the X and Y directions and 0.1 A in the Z direction, sufficient to visualize individual atoms. This superb resolution is achieved because the tunneling current is emitted essentially from the last atom on the end of the tip. In reality, tips are not smooth as indicated by Fig. 1B, but have atomic corrogation and many different asperities or "minitips" that can emit tunneling current. However, because the tunneling current (in vacuum) decreases by about a factor of 10 for every 1 A of separation, and because generally there is one minitip that is a few angstroms closer to the sample than the others, it is usually the case that the vast majority of the tunneling current flows through only one protrusion. It is really the exponential distance dependence of tunneling current that gives STM its tremendous resolution. It is important to note that the magnitude of the tunneling current depends not only on the tip-sample separation, but also on the electron density of states (number of states per volume per unit energy) in the sample and the tip bias. If the tip is biased negatively, electrons tunnel from the tip into empty electronic states in the sample surface. If the tip is biased positively, electrons tunnel from filled states in the sample to the tip. Therefore, the contrast or corrogation seen in STM images is really a map of the spatial distribution of electron states, either empty or filled, depending on the tip bias. In many cases, the electron density directly reflects atomic positions on the sample. As we shall see in Section II, however, this is not always the case. Additionally, there can be a nonlinear dependence of the tunneling current on the tip voltage, reflecting the spectrum of the electronic energy states at the sample surface. Examining the voltage dependence of the tunneling current is the basis of local tunneling spectroscopy, which is not covered in this article, but is discussed extensively by Wiesendanger (1994). STM imaging can be accomplished in air, vacuum, or under fluids, though the best quality images are usually taken under vacuum since contamination of the tip or sample by adsorbates (e.g., water) is minimized. The time required to produce an atomic-resolution STM image is tens of seconds to minutes depending on the scan size and scan speed. Samples for STM analysis must be conductive. F = k Az, where k is the cantilever force constant (in nN/nm, analogous to a spring constant) and Az is the vertical deflection. Cantilevers can be fabricated with force constants as low as 0.01 nN/nm, so that forces as small as 0.1 nN give nanometer deflections that can be detected easily. The sensitivity of AFM to forces smaller than the bonding forces between individual atoms was the motivation for the name "atomic force" microscopy. 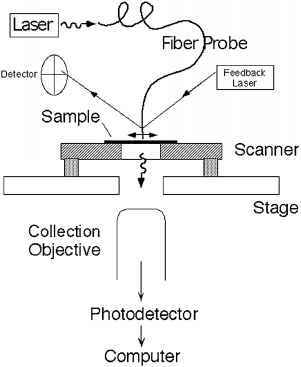 Some investigators instead use the name scanning force microscopy (SFM) to emphasize the relationship to other scanning probe techniques. FIGURE 3 Different AFM imaging modes. (A) Contact or normal force mode. (B) Lateral or friction force mode. (C) Intermittent contact mode, also known as noncontact or tapping mode. (D) Force modulation mode. signal indicating how much the cantilever has deflected sideways. The optical beam method allows deflections as small as an angstrom to be detected. AFM instruments are designed to scan either the sample or the cantilever-tip assembly. Figure 2A shows a sample scanning configuration. In contact mode operation, the sample is scanned underneath the cantilever tip, which remains stationary. The user defines a setpoint cantilever deflection (actually, a voltage proportional to the deflection) that is to be maintained by the feedback electronics during scanning. If the cantilever deflection increases, the feedback electronics applies a voltage to the Z axis of the piezo to cause the sample to retract from the lever, thus lowering the deflection back to the setpoint value. Conversely, if the cantilever deflection decreases, the feedback electronics applies a Z-axis voltage to cause the sample to move toward the lever, increasing the deflection back to the setpoint value. As in STM, the feedback is done very quickly, and recording the Z position as a function of X-Y coordinates produces a topographic map or height image. Resolution in AFM is governed principally by the sharpness of the probe tip, although the sample characteristics and specific operating mode are also important. Commercial cantilever-tip assemblies are made from silicon or silicon nitride using conventional microfabrication methods common to the semiconductor industry. 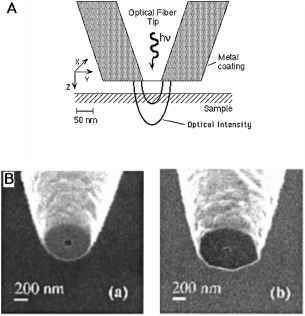 Figure 2B shows an electron micrograph of a microfabricated silicon nitride probe. Commercial probes can be made with tip radii as small as 10 nm, but 20-40 nm is more common. With a 20-nm-radius tip it is possible to obtain images of surfaces that show topographic corroga-tion due to atomic or molecular packing. As AFM has matured, a number of more sophisticated imaging modes have been developed. 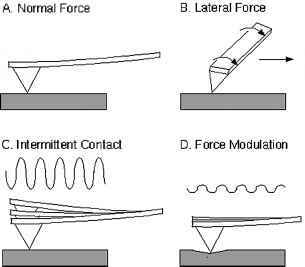 In lateral force mode (Fig. 3B) the sample is scanned sideways relative to the long axis of the cantilever. Torsional forces exerted on the tip cause the cantilever to twist and consequently to deflect the optical beam horizontally on the photodetec-tor. Recording the lateral deflection or twisting of the cantilever as a function of X-Y position gives a lateral force map. Lateral force images are particularly sensitive to friction force between the tip and sample, and therefore these images are also called friction force maps. 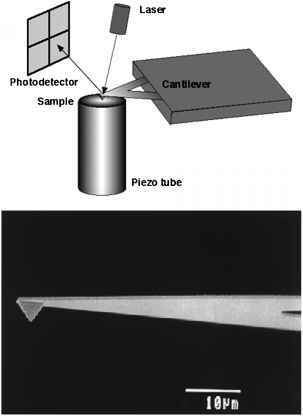 Two other popular scanning modes involve oscillating the cantilever-tip assembly while the sample is scanned (Figs. 3C and 3D). In tapping mode (Fig. 3C) the tip is oscillated vertically with an amplitude of 50 to several hundred nanometers and makes contact with the sample at the bottom of every downstroke. The optical beam and photodetector assembly is used to detect the oscillation amplitude, which is dependent on how close the tip is to the sample. The feedback control electronics maintains the oscillation amplitude at a user-defined setpoint value and a topographic image is generated in the same fashion as in contact mode, i.e., by recording the Z position of the sample as a function of X and Y coordinates. The advantage of this intermittent contact method is that shear forces that are always exerted on the sample in contact mode are eliminated. For imaging soft samples, such as biological specimens, this has proved to be an advantage. If the tip is allowed to oscillate near the surface but not to touch it (called noncontact mode), it is possible to obtain true atomic resolution under favorable circumstances. Another operation mode is known as the force modulation method. This is a contact mode technique, but instead of maintaining fixed cantilever deflection, the tip is periodically pushed into the sample, as shown in Fig. 3D. This periodic force modulation is accomplished by oscillating the Z position of the sample at a known amplitude (typically 2-5 nm). If the region under the tip is stiff, the probe will not compress the sample and the cantilever will deflect by the oscillation amplitude (e.g., 2 nm). If the sample is soft, the probe will push into the sample and the cantilever will deflect somewhat less than the full oscillation amplitude. Thus, recording the modulation in tip deflection as a function of X and Y position produces a stiffness map of the sample. Most AFM techniques (e.g., contact, lateral force, and tapping modes) can be performed in vacuum, air, or under liquids. AFM can be applied to insulators as well as conductors, which means the technique is applicable to a wider range of materials than STM. 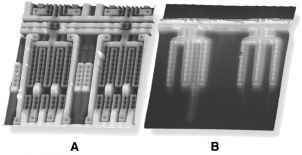 Since its invention in 1981, the STM has been valued for the remarkable atomic-resolution images it produces. An excellent example is shown in Fig. 4, which shows a 10 nm x 10 nm topographic image of the surface of a silicon crystal. The bright spots in the image correspond to individual silicon atoms that are 2.4 A in diameter, highlighting the superb resolution of the microscope. Indeed, it is an attractive feature of STM images that atomic-level defects can be resolved; there are clearly atoms missing (vacancies) in some portions of the image. Historically, the STM observation of the Si "7 x 7 reconstruction" was extremely important since the atomic arrangement of this surface was in dispute until the atomically resolved STM images became available. silicon to form silicon bromide (SiBr4), which is also a vapor. Thus, this reaction results in etching of the silicon surface. The atomic-resolution STM image shows how this etching occurs. Two planes (or terraces) of silicon atoms are visible in which pits have formed. These pits are elongated along rows of silicon atoms for reasons related to the energetics of etching. In addition, pits on the top plane (upper left) are oriented at 90° with respect to the bottom plane (lower right) because of details of the silicon crystal structure. Also evident are bright lines on top of the terraces that run perpendicular to the pits. These lines represent regrowth islands, produced from silicon atoms that are released onto the terrace during an etching event. STM is a useful tool in understanding such etching processes with atomic detail. on a copper single-crystal surface. This process was carried out in an STM enclosed in ultrahigh vacuum with the copper surface held at 5 K. A submonolayer quantity of iron atoms was deposited on the copper. The STM tip was used to visualize these adsorbed atoms and to drag them across the surface to form the ring structure. The key to this process is the ability to grab an atom with the STM tip. This can be done by applying a voltage pulse to the tip such that the iron atom hops off the surface and onto the tip. The iron atom can then be redeposited somewhere else by applying another voltage pulse. Perhaps the most remarkable aspect of the images in Fig. 7 is the observation of electron standing waves inside the completed ring. Electrons are quantum mechanical in nature, meaning they exhibit wavelike properties. Confining an electron within a two-dimensional "corral" is predicted to yield a circular electron density wave. Figure 7 shows this wave is visualized directly by STM of the completed corral. This is a particularly beautiful confirmation of the wavelike properties of electrons. 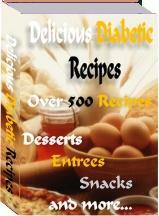 Like the images in Fig. 6, the visualization of this electron wave is possible because STM is sensitive to electron density. Note that at the bias voltage chosen, the copper atoms underneath the ring are not readily apparent. substrate. A particularly interesting observation is that the nickel ions at the center of the molecules on the left show up as holes (dark spots), whereas the iron atoms in the molecules shown on the right appear as peaks (bright spots). This is not because there are actual height differences in the two images, because both molecules are planar. Rather, the interpretation rests on the different electronic energy states in the iron- and nickel-containing molecules. 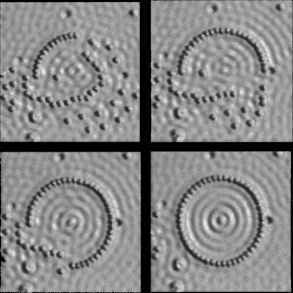 In these experiments, the tip was biased negatively with respect to the samples; consequently, the images reflect the density of empty states in the molecules. Iron(II) ion has fewer electrons than Ni(II) ion and consequently there are more empty states (d orbitals) to tunnel through, giving iron brighter contrast. This is an excellent example of how, through its sensitivity to electronic structure, STM detects chemical differences in adsorbed molecules as well as topographic differences. 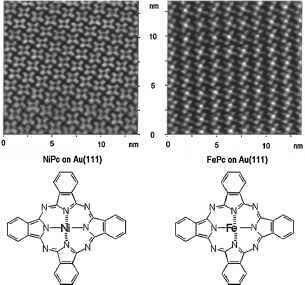 In a similar fashion, a number of workers have shown that STM images can distinguish double bonds from single bonds in adsorbed molecules. Like STM, AFM can be used to view the geometrical arrangement of atoms or molecules on surfaces, and the technique can be applied to electrical insulators as well as conductors. One important application of AFM is the visualization of crystallization processes in solution. 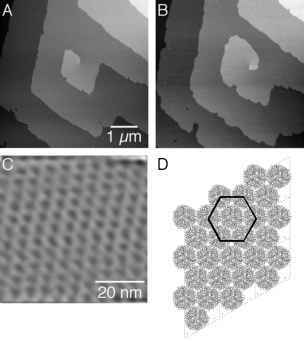 Figures 8A and 8B show contact mode topographic images of the surface of a growing insulin crystal. 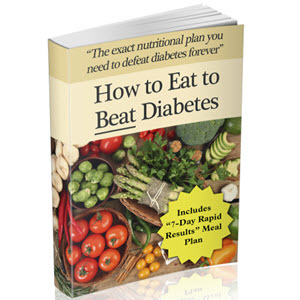 These images were acquired under an aqueous solution containing dissolved insulin. Terraces are visible that correspond to single layers of insulin hexamers. Figure 8C shows a molecular-resolution image taken in contact mode on one of the terraces. The molecular packing symmetry observed can be used to determine which crystal face is viewed; Fig. 8D shows a computer representation of the packing of insulin hexamers on the (001) crystal face. Increasingly, AFM is being applied to biological imaging and visualization of individual macromolecules such as DNA. Figure 9A shows tapping mode images taken under solution of human chromosomes. Figure 9B shows a 500 nm x 500 nm tapping mode image of closed-loop (bacterial plasmid) DNA molecules adsorbed to a mica surface. It should be appreciated that the DNA molecules appear much wider than they actually are because the tip is not infinitely sharp but has a finite radius, typically 20 nm. Consequently, the observed width represents a convolution of the actual dimensions of the DNA with the tip shape. However, the thickness of the DNA chain can be accurately estimated by measuring the height of the DNA molecule because the height is not affected by the tip shape. By this method, the thickness of the DNA molecules is estimated to be about 1 nm (10 A). tween friction and sample stiffness or compressibility. The friction image shows that higher friction is observed on the fluorocarbon areas (which are bright) than on the hydrocarbon islands (which are dark). The elasticity map on the right has the opposite contrast and shows that the hydrocarbon is less compliant than the fluorocarbon. It can be concluded, therefore, that dissipative frictional forces correlate with the ease with which the film can be compressed. Such fundamental information is useful to investigators interested in the molecular mechanisms of friction and lubrication. Nanometer-scale mechanical analysis of surfaces, films, and even individual molecules can also be accomplished by recording cantilever deflection as a function of Z position. Because the lever deflection is easily converted to force, these measurements are called "force curves" or F-Z measurements, and are shown in Fig. 11. The tip is held at a fixed X-Y coordinate and the Z position is varied. As the sample gets very near the tip, attractive van der Waals forces cause the tip to jump to hard contact with the surface (position 2). Further extension of the sample toward the cantilever results in deflection of the lever upward (position 3) and an increasing compressive force exerted on the tipsample microcontact due to the lever deflection. Reversing the sample direction allows examination of the adhesive interaction between the tip and sample. When the sample retracts to position 4, the cantilever deflection is zero, but the tip and sample do not separate because of adhesion. Continued retraction of the sample produces downward deflection of the lever and a tensile force on the tip-sample microcontact. Only when this tensile force just exceeds the adhesion force will the tip pop off the sample (position 5). Noting the cantilever deflection at this rupture point allows calculation, via the lever spring constant, of the adhesion or pull-off force. Such pull-off measurements are used to examine adhesion in local regions on surfaces. These measurements also are used by researchers to measure nanomechanical behavior and forces associated with stretching individual long-chain molecules, like proteins and DNA. FIGURE 11 (A) Scheme of force versus Z position (F-Z) measurements. (B) Cantilever deflection (which can be converted to force) is plotted as a function of Z position (or piezotube extension). After the tip has made contact with the sample (just after position 2), continued extension of the piezo results in increasing deflection of the lever. 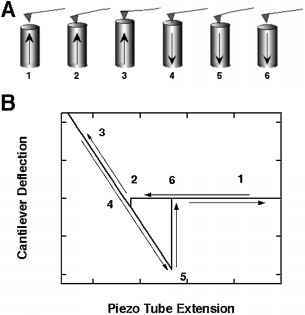 Reversing the piezo direction allows measurement of the tip-sample adhesion force. When the piezo has retracted to position 5, the cantilever is now bent downward, exerting a tensile force on the tip-sample microcontact. Further retraction results in tip pull-off (5 to 6). The cantilever deflection at position 5 allows estimation of the adhesion force using the formula F = k(Az), where Az is the downward deflection of the cantilever and k is the cantilever spring constant. discussed below. In illumination mode, the optical image is acquired by feeding light into the probe and collecting the transmitted, reflected, or fluorescent emission from the sample with an objective lens. Light intensity at each pixel point (X-Y coordinate) is recorded by a photodetec-tor. In the relatively less common collection mode, illumination is provided by an external source and the probe is used to collect transmitted, reflected, or fluorescence emission from the sample at each pixel. Figure 12 shows an illumination mode setup with the collection objective and tip on opposite sides of the sample; other designs have the collection optics and probe on the same side. Spatial resolution of about 50 nm is achievable routinely in NSOM images, which is about 10-20 times better than the diffraction-limited resolution in conventional light microscopes. NSOM probes are typically made from optical fiber that has been heated and tapered in a micropipet puller. An aluminum coating is evaporated onto the sides of the probe leaving an open aperture at the tip 10-100 nm in diameter, as illustrated in Fig. 13A. Laser light coupled into the fiber propagates to the tip, where it emerges from the aperture. The aluminum cladding confines the light in the X and Y dimensions to the diameter of the aperture, and thus spatial resolution is determined by the size of this opening. Unfortunately, the optical power of the probe tip also depends very sensitively on the aperture size. The throughput of the probe drops dramatically as the aperture size is decreased, and thus there is a tradeoff between resolution and sensitivity. For a good probe with a 50-nm aperture, 0.5 mW coupled into the fiber results in greater than 1 nW of radiation from the tip. FIGURE 12 Schematic illustration of an NSOM setup in illumination mode. Laser light coupled into the optical fiber propagates to the probe tip, where it interacts with the sample. Transmitted or fluorescence emission is collected below the sample stage by an objective lens, which focuses the light on a photodetector. A computer records the light intensity as a function of X-Ycoordinates. Shear force Z-position feedback, as described in the text, is used to keep the probe close to the sample and to track the sample topography. Often NSOM instruments are mounted on the stage of a conventional light microscope. NSOM is a so-called near-field technique because the optical radiation near the tip (the "near-field") is orders of magnitude greater than the radiation just 10 nm away from the aperture. Models predict that the radiation decays almost exponentially with increasing distance from the probe. Consequently, it is important that the probe be scanned with the aperture as close as possible to the sample surface to maximize contrast and resolution. Flat, smooth tip ends have been shown to improve image quality vastly by allowing for closer proximity of the aperture to the sample. Tip ends can be flattened and polished by focused ion beam (FIB) milling. Figure 13B shows examples of two ideal NSOM tips after FIB milling. To keep the aperture near the sample and to track the sample topography, shear force feedback is commonly employed. In this method, a straight fiber probe with its long axis perpendicular to the substrate is oscillated (or "dithered") by a piezoelectric device such that the aperture moves side to side. This is in contrast to the tip vibration modes discussed in Section I, where the tip oscillates up and down. As the vibrating fiber probe approaches the sample, shear forces between the probe and tip dampen the oscillation amplitude. The shift in amplitude or frequency is detected and used to generate a feedback signal to the Z-position piezo. The probe vibration can be detected optically or piezoelectrically using a tuning fork in which the fiber probe is attached to one arm. Whatever the method of detection, the upshot is that the probe vibration is kept constant by the feedback electronics. Using this shear force method, topographic images can be generated simultaneously with the near-field image. NSOM can produce high-resolution transmission and fluorescence images of a variety of samples including polymer films, proteins, chromosomes, molecular crystals, and even isolated molecules. Figure 14a shows a fluorescence NSOM image of individual dye molecules in a polymer matrix. 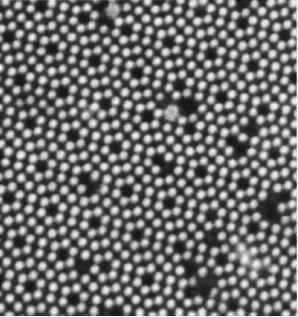 The molecules are much smaller than the tip aperture diameter, so that the fluorescent spots observable in the image are essentially maps of the electric field distribution near the tip. The diameter of these spots is an estimation of the probe resolution (~ 120 nm in this case). Figures 14b-14d show topography and NSOM images of flexible fluorescent fibers imbedded in a thin polymer film. It is also possible to map birefringence and dichroism in samples using polarized-light NSOM. More recently, there has been increasing interest in imaging opaque samples by collecting reflected light. An interesting example of this is the imaging of magnetic films using polarized radiation. 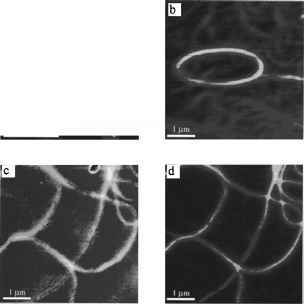 Due to the magnetooptical Kerr effect, polarized-light NSOM images reveal magnetic domains. An additional attractive feature of NSOM is that it can be used to perform localized spectroscopy. For example, the NSOM probe can excite the dye aggregates in Fig. 14at a particular location and the spectrum of the fluorescence emission can be recorded by sending the collected light to a spectrophotometer. The possibility of localized spectral analysis of sample emission dramatically increases the amount of spatially resolved, detailed structural and chemical information that can be determined by NSOM. Time-resolved NSOM spectral studies have also recently been used to investigate dynamic processes (e.g., charge transfer reactions) on submicrometer scales. Magnetic Force Microscopy (MFM) is a noncontact scanning force technique that uses magnetostatic interactions between tip and sample to image magnetic domains. MFM is a derivative of atomic force microscopy and can be performed with many commercial AFM instruments. The magnetic structure of a wide variety of samples can be investigated with MFM with a resolution of up to 10 nm, depending on the sharpness of the probe. MFM probes are often prepared by sputtering a ferromagnetic film such as cobalt-nickel or iron onto a conventional silicon microfabricated cantilever/tip assembly. Alternatively, a magnetic probe can be fashioned out of an etched, bent magnetic wire. To produce an image, the magnetic tip is oscillated at the cantilever resonance frequency and scanned over the sample at a distance of at least a few nanometers above the surface. During the scan, the tip does not touch the sample, but magnetic fields at the surface interact with the magnetic tip. Gradients in the magnetic field near the sample surface modify the effective spring constant of the cantilever, thereby shifting its resonant frequency. The shift in frequency and the accompanying change in phase and amplitude of the cantilever oscillation are detected using an optical sensor as described above for AFM. Plotting the frequency shift, amplitude, or phase of the cantilever as a function of sample position creates an MFM image. Because MFM detects magnetic field gradients, MFM images highlight boundaries between magnetic domains where the north-south dipoles are pointing in different directions. The sensitivity to magnetic field gradients also means MFM images are strongly influenced by sample topography. One approach to removing or mitigating "topographic contrast" in magnetic force images is to perform a double scan. First, a topographic scan line is recorded (e.g., in tapping mode) and stored to memory. Then the probe is lifted off the surface by a few nanometers and the scan line is repeated, except this time the magnetic force signal is recorded while the probe tracks the "memorized" sample topography. The double-scan mode allows acquisition of both topographic and magnetic images and is an effective way to deconvolute surface topography from magnetic information. storage materials. Figure 15 shows topographic and magnetic force images of a track in magnetic recording tape. The bright regions of the magnetic force image correspond to the boundaries between magnetic bits in which the north-south dipoles are oriented in opposite directions. Note that the simultaneously acquired topographic image shows very little structure, i.e., the tape is topographically flat. Images of the magnetic track give information about the bit shape, position, and edge roughness. MFM is also used extensively in magnetic materials research, for example, to study the pinning of magnetic domain walls by structural features such as grain boundaries. Electric force microscopy (EFM) is exactly analogous to MFM with the exception that the tip is used to sense electric field gradients instead of magnetic field gradients. EFM requires conducting AFM tips that interact with the sample through long-range Coulomb forces. The probes can be microfabricated from doped silicon or they can be made by metal coating silicon or silicon nitride cantilever/tip assemblies. As in MFM, the tip is oscillated at the cantilever resonance frequency and scanned over the sample at a distance of a few nanometers above the surface, such that the probe does not make physical contact with the sample. Electric field gradients associated with charges or electric dipoles present on (or slightly beneath) the surface interact with the tip and cause shifts in the cantilever resonance frequency. EFM images are created by recording the cantilever amplitude, phase, or resonance frequency shift as a function of sample position. Contrast in EFM images can be manipulated by applying dc voltages to the conducting tip to enhance attractive or repulsive electric forces. As in MFM, topographic effects may be removed by first scanning the sample topography, then lifting the tip and rescanning at a constant height (constant tip-sample separation) while acquiring the EFM signal. In principle, EFM images can be quantitatively related to charge distributions on a sample surface through mathematical modeling of the tip-sample interaction. Figure 16 shows 80 /m x 80 /m topographic and EFM images of an active integrated circuit. The light areas of the topographic image highlight the location of aluminum wires. The EFM image on the right shows which of the wires have an applied voltage. consequently has an experimental voltage resolution of a few millivolts. The spatial resolution is determined by the sharpness of the probe and is approximately 50 nm for microfabricated commercial probes. Scanning capacitance microscopy (SCM) is a contact mode variant of atomic force microscopy (AFM) in which changes in tip-sample capacitance are imaged simultaneously with surface topography. Samples for SCM analysis are generally covered with a thin insulating layer that serves as the capacitance dielectric between the tip and sample. The spatially mapped capacitance variations can be attributed to changes in the dielectric thickness, changes in the dielectric constant, or variation in the local charge carrier density underneath the dielectric. In the most typical application of SCM, which is the characterization of semiconductor devices, capacitance variations are converted via a theoretical model into a dopant concentration profile in the semiconductor underneath the dielectric. In typical operation, a conducting tip is scanned in contact at constant applied force over the dielectric layer on the sample, generating a topographic image. While the probe is scanned, a set of electronics (the capacitance sensor) is used to apply an oscillating voltage to the probe and to measure the tip-sample capacitance. The sensor measures dynamic capacitance change rather than static capacitance. A sensor typically consists of a high-frequency oscillator and associated circuitry whose resonant frequency is determined by the total capacitance of the tip-sample assembly. The instrument signal arises from the variation in resonant frequency of the circuit due to tip-sample capacitance changes as the tip scans over the sample. Commercial sensors can detect capacitance changes of 10-21 F. The tip and sample must have an insulator between them, and surface preparation is very important to obtaining good SCM images. Resolution is now regularly 10-20 nm. The most important application of SCM is two-dimensional dopant concentration profiling in semiconductors. However, the raw capacitance-voltage data obtained from SCM must be converted by a mathematical model into a dopant concentration. Therefore, development and validation of appropriate models represents a large part of SCM methodology. To validate the various models, other experimental techniques must be employed to measure and verify the dopant profiles independently. SCM data are usually compared to secondary ion mass spectrometry (SIMS) measurements of dopant concentrations. Spreading resistance profiling (SRP) and computer simulations are also employed to check model validity. Appropriate calibration of SCM has been achieved in important semiconductor materials, such as silicon and gallium arsenide, and SCM has been used successfully to measure dopant profiles across p-n junctions in these materials with 20-nm resolution. Figure 17 shows SCM images of three different dopant regions in a silicon wafer covered with a thin layer of silicon oxide (SiO2). The contrast in the image corresponds to different concentrations of n-type (regions I and III) and p-type (region II) dopants. In SECM, a tiny electrode is scanned over a surface immersed in electrolyte solution. The electrode probe senses either electrochemical current or potential, and can be used to map chemical reactivity or the distribution of ions across surfaces. A typical amperometric (current sensing) probe, shown in Fig. 18A, is fabricated by sealing a Pt or Au wire or a carbon fiber in a glass capillary. Potentiometric probes are usually ion-selective electrodes that are sensitive to a given ion, for example, Na+ or Ca2+. The potential measured by these probes is proportional to ion concentration. FIGURE 18 (A) Illustration of an SECM amperometric (current-sensing) probe. (B) SECM operation modes. uations, the feedback mode cannot be applied. Instead, a generation-collection approach (Fig. 18B) can be used. In this mode, molecules generated by surface reactions on the sample are collected by the tip and detected am-perometrically, i.e., the species is irreversibly oxidized or reduced. There is no feedback mechanism to regulate tipsample separation in this mode, and consequently the sample must be very flat or the tip must be sufficiently withdrawn to avoid a tip crash. Maps of tip current as a function of position reveal the "hot spots" for chemical reactivity on the surface. For this reason, generation-collection mode SECM can be used to examine the reactivity of solid catalysts in solution. Interestingly, generation-collection SECM has also been applied to the study of chemistry at the interfaces between two immiscible liquids. Instead of detecting them amperometrically, chemical species diffusing from the surface in generation-collection experiments can be detected potentiometrically with an ion-selective electrode (Fig. 18B). Potentiomet-ric SECM has been used successfully to image dissolution across ionic crystal surfaces, such as Na+ dissolution from NaCl surfaces. Potentiometric detection has the advantage that the concentration of diffusing species is not perturbed, i.e., molecules or ions are not electro-chemically oxidized or reduced to some other charge state. In general, SECM resolution is limited by diffusion as well as probe size. Spatial resolution of 200 nm has been demonstrated in favorable cases.